1. Organize a nature outing: Since May is one of the loveliest times of year, organize a family outing to a nearby park, lake, or other scenic treasure. 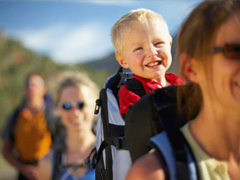 Plan an activity that everyone can enjoy, such as a picnic, hike or stroll. If the weather fails to cooperate, have a “Plan B” in mind, such as keeping ingredients on hand for a family meal that everyone – except mom – can help prepare at home. 2. Grow an herb garden for mom: You don’t have to be a gardening guru to start a small herb garden. It’s a great way to give mom a culinary gift and teach kids how plants grow. The easiest way to plant herbs is in pots or window boxes. You can find inexpensive containers at tag sales and garden centers, where you’ll also be able to find inexpensive seed packets for culinary herbs such as parsley, mint and basil, as well as a good quality potting soil. To plant: sprinkle the seeds onto the soil in the container, then cover with more soil. Place the container in a location that has good light for about six hours a day. Then water regularly and watch the herbs grow. 3. Make mom a wind chime: Making a wind chime is a fun craft for parents and kids. One kind that you can create requires three four-inch ceramic flowerpots, some all-purpose clothesline and an old skeleton key. Cut the clothesline to approximately four feet in length, then double the line to create a loop and hang the key in the middle. Mark on the line where you want each pot to hang, one above the other. Starting from the bottom, above the key, tie a triple knot on your mark, then add a pot. Repeat for each pot. Tie the ends of the line together and hang in a place where it will catch the wind. The key will clink against the bottom pot in the wind. 4. Offer helping hands: Mother’s Day pays tribute to all mothers, so it’s an especially meaningful time to help a mother or grandmother in need, even if you aren’t actually related to them. Consider doing outdoor chores as a family for a neighbor who is a “grandma” to everyone. This could include mowing the lawn, pulling weeds or helping them de-clutter the garage. You could even offer free babysitting to a new mom who is feeling overwhelmed, allowing her to get out of the house for a day to get some fresh air. 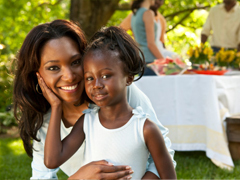 What Mother’s Day activities would you add to our list? Share them in the “Comments” box below.